It's getting late on a Wednesday. The market run is done (more onions! apples! carrots! ), Caitlyn's off to bed, the kitchen is cleaned up, and we've opened up a pint of cider for the evening. Thanks to everyone who stopped by and left a comment on the Charming Travelers giveaway. And thanks for all your kind thoughts about my 500th post! 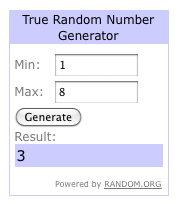 I've asked Random.org to select our winner. Congratulations to Commenter Number 3, Charlotte! I'm sending you an email shortly. And after KCWC, I'll share what I made with the Travelers I chose from the pack!